This was originally intended to be a longer trip in northern Saskatchewan. 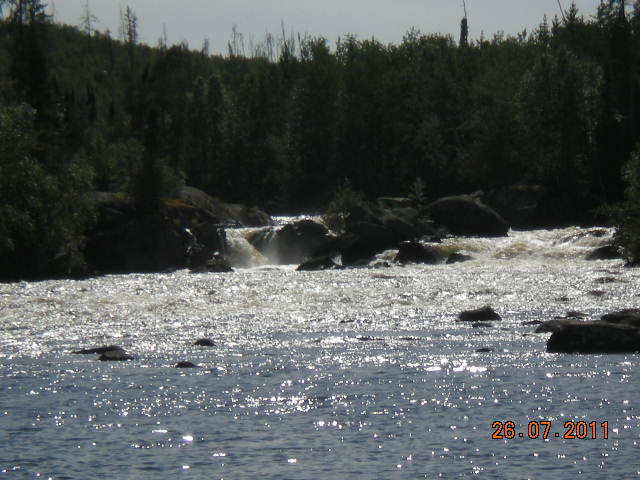 The Plan was to go from Davin Lake to Wathaman Lake then up the Pink River to the high of land and down the Paull River to the Churchill River and then to Missinipe. The Accident happened and a New Plan was made and executed. The trip described below would make a lovely 5 day trip. Davin and Wathaman Lakes are beautiful large lakes, with many rocky islands and headlands. Davin Lake has some nice sand beaches, at the north end of Currie Bay and around the Robertson Narrows. The Pink River below Pink Falls has only some areas of sluggish current in four narrow sections in between Wathaman Lake and the falls so it was easy to paddle upstream as far as the falls. On the big lakes, campsite possibilities were fairly numerous. Significant portions of Davin and Wathaman Lakes were burned in 2010, though unburned sections and islands remain. Good fishing abounds. Access: Davin Lake Lodge makes a good starting point. It is located at kilometer 74 north of the Southend junction on Highway 905. Their camp is at the head of Currie Bay, on sandy jack pine flats with a sand beach. Secure vehicle parking could be arranged with the lodge owners. They also have a campground and lodge rooms to rent. There is a provincial campground nearby with a boat launch but the campsite was destroyed in a forest fire in 2010. It is neither secure nor pretty at present. We had arranged with Ric at Churchill River Canoe Outfitters to have a driver come with us from Missinipe and then drive our vehicle back there because that was to be the end point for our trip. Our route: We paddled south down Currie Bay, through Robertson Narrows and then north up towards Wallace Bay. There were some nice sand beaches around Robertson Narrows. Davin Lake Lodge has a cabin for rent in the narrows. We camped at an outfitter’s shore lunch location on a small island at the mouth of Wallace Bay – a scenic but moderately exposed rocky point on an island, with picnic tables and a fire pit (Grid Reference 768016). There were 2 tent sites and possibly more in more exposed locations. At the north end of Wallace Bay, the outlet creek flows a few meters over a narrow, rocky 2 foot drop into Wathaman Lake. We looked hard at this short drop but the current appeared as though it would take our canoes toward a nasty sharp rock on the right side of the channel with no room to avoid it. We opted not to try to run or line down it. There was a good portage (75 meters) (G.R.770060) on the north side of the creek, with floating pole platforms to ease loading on the Wathaman side. The total distance on Davin Lake was about 20 kilometers. The Davin Lake Lodge has an outpost camp on the west side of Wathaman Lake, across from where we entered Woodman Bay after the portage. Our route on Wathaman Lake took us SW 7 kilometers down Woodman Bay, past high rock headlands and islands. At the southwest end of Woodman Bay the first section of current is encountered but it was not strong and we were able to paddle up it. For the next 12 kilometers, the Pink River was usually wide and calm, with some current in the occasional narrows. As we got closer to Pink Falls we were on the lookout for possible campsites but there were not many possibilities after leaving Wathaman Lake. 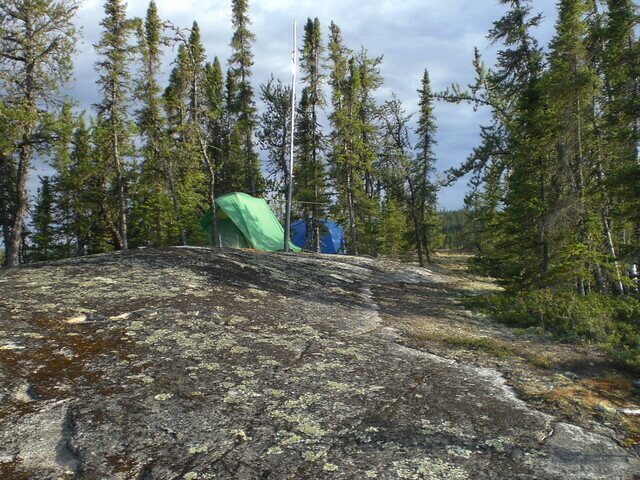 We noted a campsite at another outfitter’s location (G.R.669953), on a scenic, sheltered point about 2 kilometers north of the Pink River Falls. There were 2 to 3 tent sites. Since it was not late in the day, we paddled up to Pink Falls in the hope that there might be another campsite closer to the falls but there wasn’t. Since we were at the falls we decided to see if we could locate the old portage trail around them. We scrambled through the bush and along the river but, at first, only found a very rough trail along the very edge of the river which led to a very small eddy immediately above the falls. It did not seem like a great trail or a great location for the start of a trail going downstream due to the small size of the eddy, the speed of the current and the fact that the falls are not readily apparent from above. It didn’t make sense as the end of a trail going upstream since, after launching above the falls, one would have to make one’s way upstream through some very fast water with a very rough and wooded shoreline. We thrashed further through the bush along the river and noticed that there was a fairly continuous rapid in this section above the falls and that there were few decent eddies in this section. The outfitter at Davin Lake had told us of a rescue he had made of a solo paddler who had gone over the falls and lost everything except his canoe. That canoeist was fortunately that the outfitter was there on that day because it’s a long way from Pink Falls to help. The outfitter said he took the man and canoe back to the lodge and fed and housed him for a couple of days. The paddler bought some stuff from them and then proceeded on his way. We continued to beat our way through the bush until we came to a small widening of the river - a calm pond between sets of rapids. That seemed like a good place to start a portage trail to us so we walked away from the river and eventually came upon the old trail. Although it was brushy and had some fairly large trees growing close to it and some deadfall across it, we were able to follow it back to a calm bay below the falls. It had a consistent, gentle gradient and a track still visible in the moss. By that time we decided it was time to make camp so we headed back to the campsite mention above. The next morning we left our camp set up and, armed with chainsaw, handsaws and machetes, we paddled back to the falls. After about 3 hours work from the four of us the trail was in good shape and flagged with surveyors tape at both ends. One of our group explored the old trail beyond the pond and found that it climbed a rock ridge and entered a burned area where it was hard to follow and where it was choked with tangled deadfall. He didn’t go very far up the trail due to the difficulty of walking through the deadfall. It was a hot day so we decided to take the afternoon off to clean up and rest at our campsite. I am happy to report that there is now an excellent portage trail of about 600 meters with the downstream landing at G.R.663933 and the upstream landing at 661929. The next morning we loaded up and paddled to the start of our “new” trail. The portage went well and we loaded our canoes at the small pond and paddled across to the start of the upstream rapids. Tracking and wading went slowly due to sharp, slippery rocks, a rugged bush-choked shoreline and a strong current but we made our way up a few hundred metres of the rapid. The Accident: At one particularly difficult section, one of our group slipped on a rock and extended his arm to break his fall. He said that he heard a crunching sound and felt a something happen to his shoulder. We continued onward for a few minutes but he reported that he was suffering a lot of discomfort. The New Plan: We discussed the situation and, considering that The Plan was to go further away from assistance and that we were not sure about the extent or ramifications of the injury, we decided that we should stop the trip and return to Davin Lake Lodge. The injured paddler did not feel capable of maneuvering their canoe through the rapids so he and his partner walked through the bush down to the pond. My partner and I ran our canoe down through the rapids to the pond. We left our canoe for them to paddle to the start of the portage and we walked back up and ran their canoe down to the pond. The injured person found that he couldn’t lift his arm very high without considerable pain but, when someone loaded him, he could carry things on the portages – this was very helpful. We completed the portage to below Pink Falls but just as we finished the portage a thunderstorm came over so we sheltered under a small tarp for 30 or 40 minutes until it passed. By this time it was getting late so we paddled back to our campsite of the previous two nights and stayed there again. If one were to consider doing our original trip, the Pink Falls/Collins Rapids section poses a significant obstacle. Above the Pink River Falls, as far as we went and could see, there are sections of Class II rapids (Collins Rapids) through which canoes could be dragged with difficulty. The boulders were slippery and the current was strong. Walking along the shore was very rough. As an alternative to wading and tracking, it might be possible to re-establish the whole of the portage trail around Collins Rapids and thereby make your way up the Pink past Collins Rapids. Coming downstream, from the parts we saw, it looked like one could run those parts of Collins Rapids, stop at the pond and do the portage to get around Pink Falls. I would not recommend going beyond the pond when paddling downstream. The injured paddler found that he could paddle quite well on one side and somewhat awkwardly on the other side so we were able to make reasonable progress. We got lucky with the wind on Woodman Bay and were able to put up a small tarp as a sail. We sailed almost to the portage into Davin Lake. That night we were back on our first campsite on the small island in Wallace Bay of Davin Lake. The next day we were back at Davin Lake Lodge. Now we had another small problem - we were back at the Lodge but our vehicle was about 3 hours drive away in Missinipe where our driver had taken it. At that point, we had a lucky turn of events. There was a busload of fisher-people from further south in Saskatchewan at the lodge and they were scheduled to leave the next day and were going past Missinipe (there is only one road in that area). When we asked the bus driver if we could buy a ticket or pay for a ride, he pretended to be calculating the cost of the ride and then told us we could ride for free. We set up our tents in the Lodge’s campsite and had hot showers – oh, what luxury! The next morning we left camp set up and two of us took the bus to Missinipe while two stayed behind to read and relax in the sun. Ric gave us a very strange look when we walked into the office of Churchill River Canoe Outfitters so we had some explaining to do. The injury was getting better every day so after we told Ric our story, we asked him about a shorter, less rigorous trip closer to Missinipe. We got our vehicle, drove back up to Davin Lake Lodge, spent one more night there and then drove south to MacLennan Lake. The report about the new trip is another story for another time. Last edited by Ralph on August 31st, 2011, 2:36 pm, edited 1 time in total. Thanks for the great report Ralph. The time and effort you put into writing it up is greatly appreciated! I hope the paddler that suffered The Accident is doing OK.
You're welcome for the trip write-ups. The victim of the accident is fine and was able to go on a four day backpacking trip after we got back from Saskatchewan. He found out that he partially detached the long attachment for his bicep. Evidently this is a fairly common injury as one gets older. They don't do anything for it. In time, it will heal to a certain extent and other muscles will take over the load. After we got back jmc pointed me to your blog about going from Hickson Lake back to Missinipe. Really interesting. We were looking forward to the paintings in the narrows and to the downhill run on the Paull and Churchill. Oh, well, maybe another year. We have now considered doing as you did - getting flown in to Hickson. Flying into Hickson was a great experience. It was my first fly-in canoe trip. The pictographs are impressive. 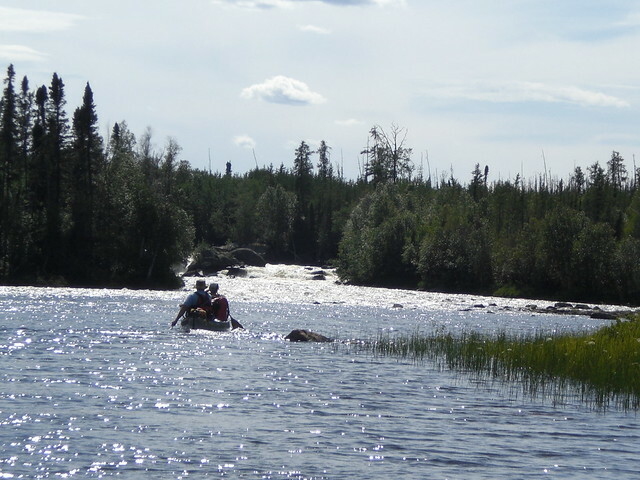 The portage into Paull Lake though was a tad rough and the most experienced canoe tripper in the group (Dave Bober) rated it among his worst. I think the portage may have burned since we were through. Another extraordinary contribution to the paddling community! Not many of us explore such routes and go to such effort to clear trails, document campsites and portages, etc.